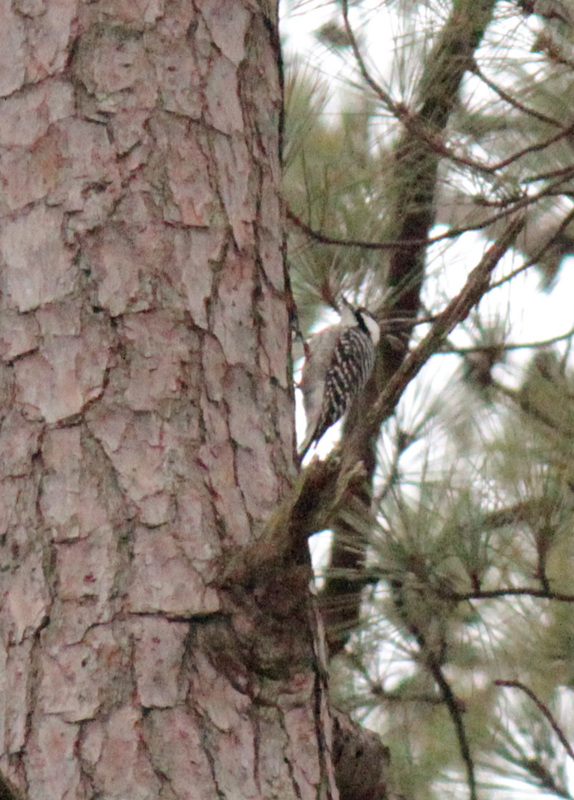 A retired Arkansas National Heritage Commission employee was kind enough to take me and a fellow birder out to the commission’s Pine City Natural Area to find the Red-Cockaded Woodpecker. 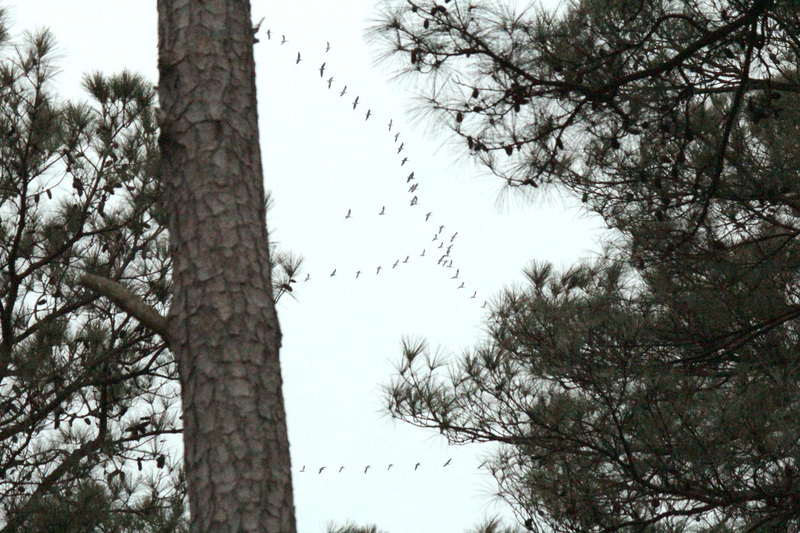 The natural area also includes the “Lost Pine of Arkansas” — the loblolly pines. According to the commission, the pines are now an isolated population within the plain and, as a result, are now genetically distinct from the loblolly pines found elsewhere in the United States. 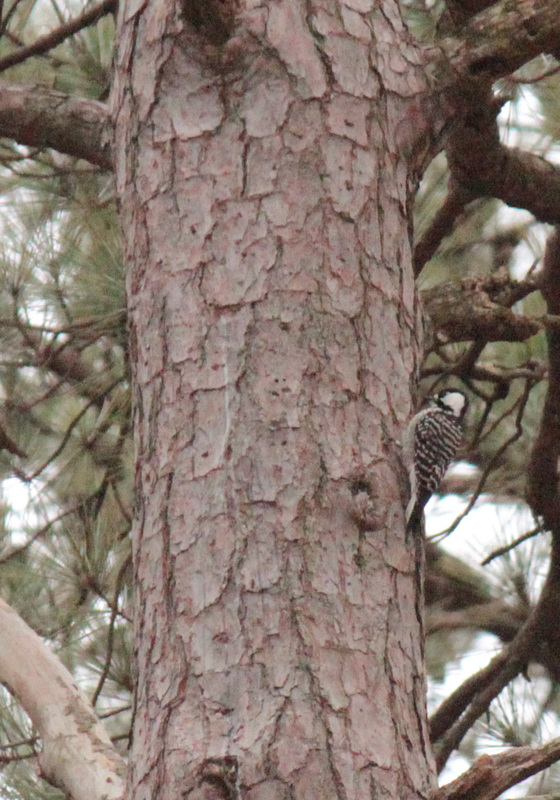 Mature southern pine forests are the main home to the Red-Cockaded Woodpeckers — one of the few bird species endemic to the United States, according to allaboutbirds.org. The birds’ “extreme habitat specificity and loss of breeding habitat” has since caused it to be listed as federally endangered. 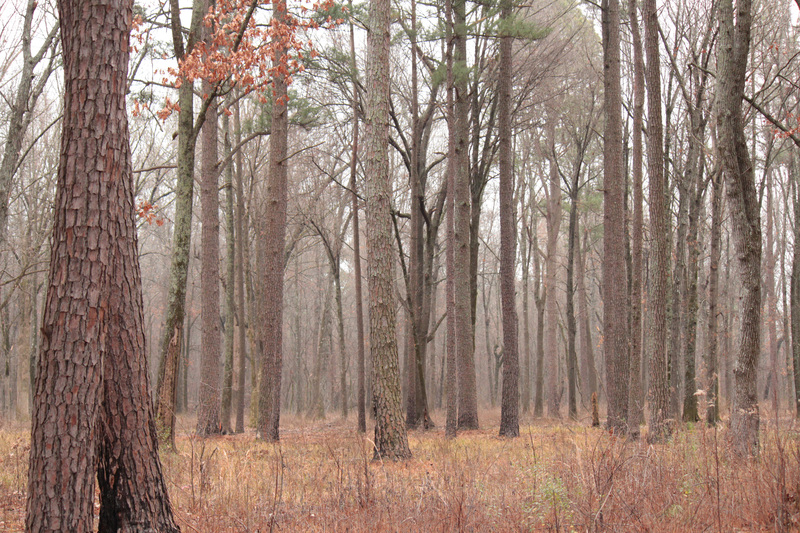 State workers now help maintain this area to sustain the Red-Cockaded Woodpeckers’ population. 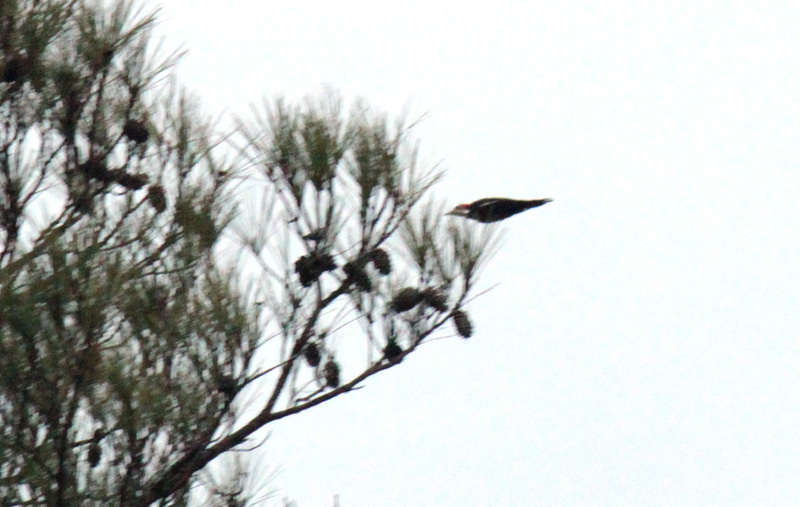 The birds prefer longleaf pines, and only nest in cavities of live pines. The commission’s work includes placing wire around the bottom of trees with nests to keep snakes away and placing metal around the nests (below) to ensure other types of woodpeckers will not takeover the cavities. According to allaboutbirds.org, trees infected with red heart fungus are often selected since the fungus softens the wood, allowing the woodpeckers to dig out a cavity. 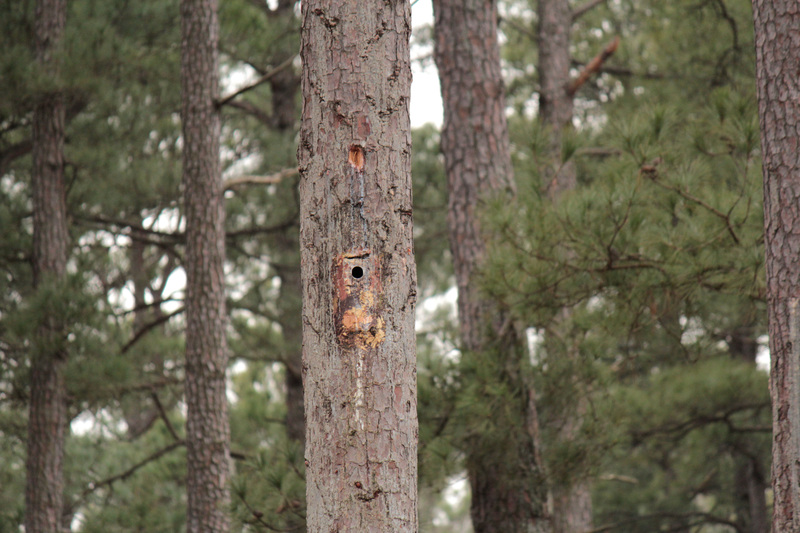 The live pine tree then leaks gum around the nest hole, helping to keep tree-climbing snakes away from the nest. The woodpeckers live in small family groups with only one breeding pair. 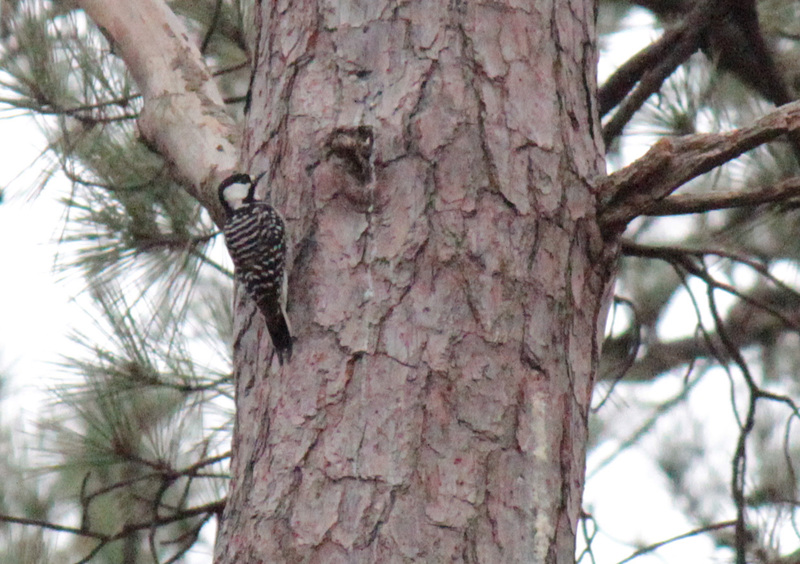 The area we visited had about 10-15 woodpeckers living there. The commission had marked each tree with nests, and we even found an additional tree (below) that was not yet marked. We arrived about 4 p.m. to walk the area, find the nests and get in place for when the woodpeckers arrived. Apparently, the woodpeckers leave their nests just after dawn, have a morning rally of sorts and then head out to forage for food as far as a mile away. They head back to the nest around sunset. The first bird we saw was the above pictured Pileated Woodpecker, which our guide was delighted to see flying in the opposite direction. Apparently the Pileated Woodpecker wreaks damage on the Red-Cockaded Woodpeckers’ home. Eventually, the first round of Red-Cockaded Woodpeckers arrived. The five to six Red-Cockaded Woodpeckers called out to each other, climbed up and down the trees with nests, and finally swooped into their nests for the night. Their arrival, greeting and turn-in for the night was actually pretty quick. We decided to stay there a little longer just to be sure they wouldn’t come out again. For the next 20 minutes, all we heard were geese and more geese. We were about to head back to the car when we heard a second group of Red-Cockaded Woodpeckers arrive. Thankfully, there were no geese overhead. This group stayed out for a while, allowing us to get a pretty good glimpse of them. Our guide kept a record of how many birds we saw, the time they arrived and the time they went to bed to give to his old coworkers. He plans to update them on the unmarked tree we found as well as information about which birds. Most of the birds are banded — you can see the band in the above picture. 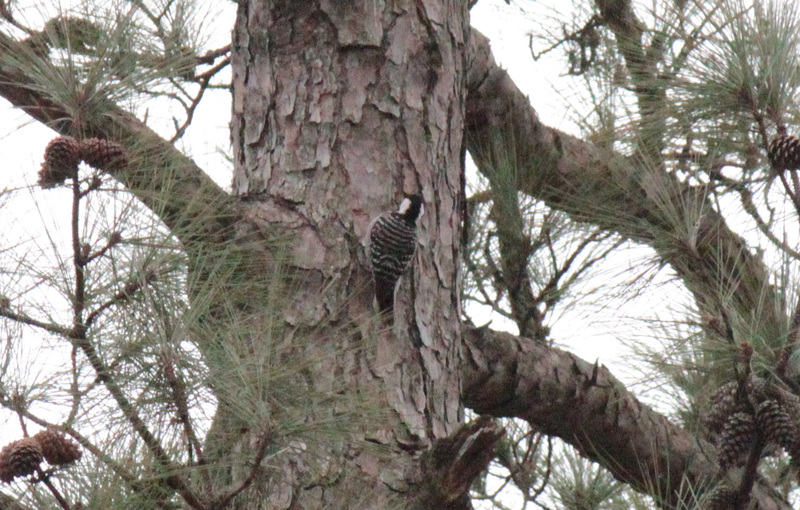 It was also interesting to learn that the commission does occasionally relocate one of these of woodpeckers to other nearby colonies, such as in Louisiana or Texas. 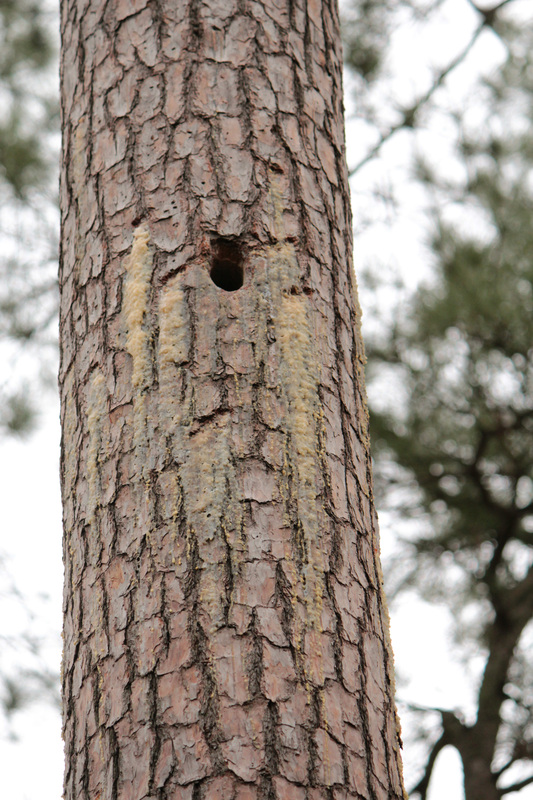 In the past, woodpeckers were taken from these sites to help populate the Arkansas colonies. If one of the birds are relocated, our guide said its done while the birds are young to help them adjust better to their new home. These birds are taken after they arrive home to nest at night. Workers place a soft cage next to the cavity, lightly scratch the bark and then close the door once the bird flies into the cage. The bird is then driven all night to be placed in its new nest before dawn. We ended up spending three hours at the Pine City Natural Area. It was fascinating — I really enjoyed the visit, which ended with a splash. I was crossing a ditch when my left foot sank deeply in mud. For a second or two, I figured the Pine City Natural Area would gain a left boot. I was luckily able to get de-mudded without getting too wet. My boots were about knee-high and the water came to just about an inch below the top of the boots. I ended up having only my left sleeve wet. Not bad at all!